United Nations Secretary General Ban (Family Name) Ki-Moon (Given Name) is a South Korean National. In January of this year we launched a campaign personally urging him to take action to stop the torture and mass murder of millions of dogs in his country’s dog meat industry. The Secretary, however, did not respond to us himself; instead, we received a form letter from the United Nations. Click HERE to see the bureaucratic response the United Nations Secretary General’s Office is sending out in answer to our protest letters! 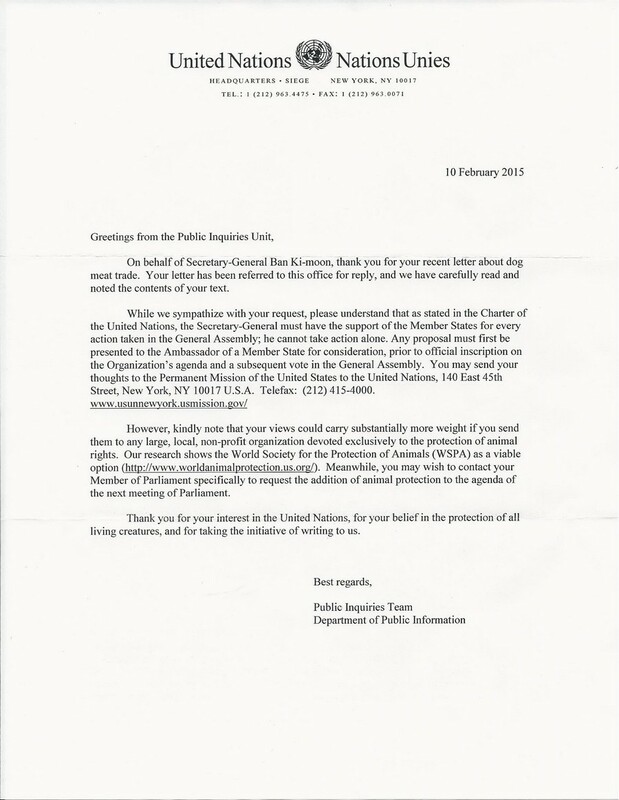 The letter states that basically there’s nothing Secretary General Ban Ki-Moon can do to stop the dog meat cruelty in South Korea. We must not let one of the most powerful man in the world give us an excuse that he is “powerless”. KOREANDOGS.ORG needs your help with “Ban Ki-moon: UN Secretary General Ban Ki-Moon: Stop the torture and murder of millions of dogs and cats in South Korea”. Join KOREANDOGS.ORG and 18,976 supporters today.